Blaster is not only the official Autobot communications officer, but he is also a morale officer as well. He can charge into battle playing raucious ,earsplitting scores that can stir even the most indifferent warrior to arms. He can hold his own with the likes of Soundwave and his minions with able soldiers of his own. 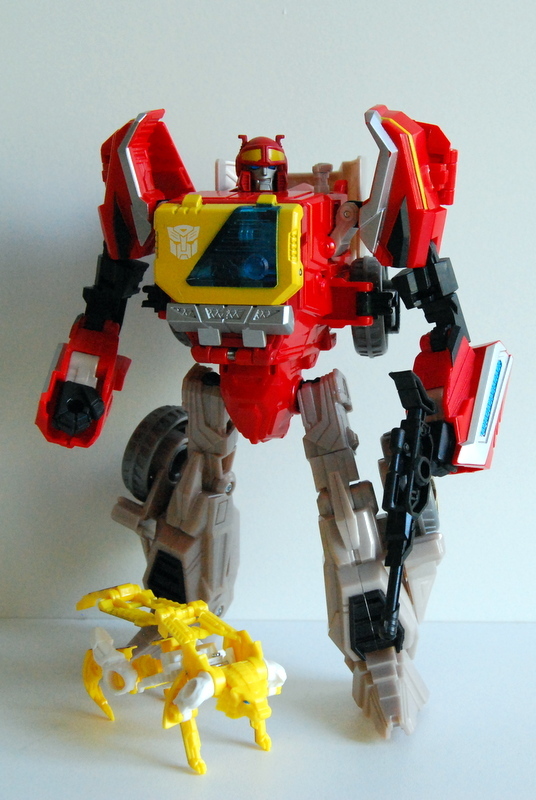 He's very tough and is one of the strongest warriors in the Autobot army. Blaster was always one of the Autobots that's on my short list. His presence among the G1 Autobot ranks was inescapable. He was head,shoulders, and torso above his archrival, Soundwave, and had a very current looking alt mode as well. Of course, he was one of the few Autobots cooler than Soundwave. I liked Blaster a lot, but 1985 came and went-- no Blaster. I definitely had him on my short list, along with Jetfire (which I got), Grimlock, Omega Supreme and Optimus Prime. Today, I can say that I have all of the updated versions of 3 of those 4 and then some. Among them, Blaster. Toywise, Cybertronian Blaster is a mixed bag. I will be comparing him to the other figure closest in detail to him, Deluxe Cybertronian Soundwave. Each one has strengths , but you would be surprised at the weaknesses, so -- On to the Review!!!! Transformation: This is simpler than the transformation of Deluxe Soundwave. Huh? Yeah! The first thing I noticed is that the front wheels do not tuck completely behind Blaster, but do on Soundwave because of an extra hinge. Secondly, the feet fold flat on the top of Soundwave's alt mode, but tuck away on Blaster under the backplate. Overall, the transformation is innovative. I like it. It still has a few curve-balls, but fewer than Soundwave. The carry-overs from the Deluxe to the voyager are the shoulders and the "calves" . Transforming him into the Robot is a whole lot easier than transforming him into a truck. He sort of unfolds from the front. Not brain surgeon material here. The chest cavity opens and **gasp** another little dude is hiding ( more about that later). So, for the two official modes of Cybertronian Blaster, it's loads of fun. Uh-- I said official? Ah ,yes! Blaster has an *unofficial* third mode: a boom box, which requires oodles of leg work. I will explain more about each as we go along. 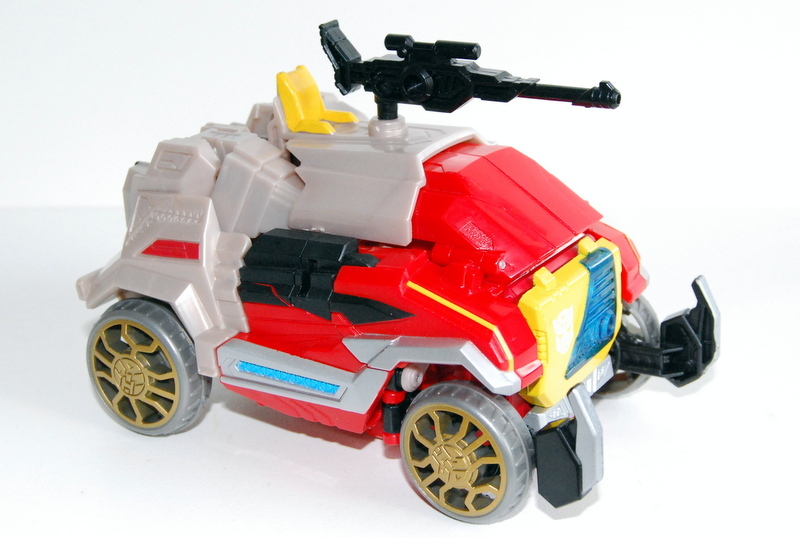 Truck Mode: This is the same curious vehicle that was introduced about two years ago as WFC Soundwave. It looks quirky enough to pass for Cybertronian, with weapons and plenty of color. This version, a Voyager, is no different. He is red instead of blue. He has gold and silver accents and he has quite stiff joints-- a must for today's Voyager class. Another intended improvement to the old deluxe is the presence of the data discs. The concept is definitely entertaining (more later). The weapon on Blaster is very G1esque , yet one fewer than Soundwave.It also looks like there is a gunner's seat. The fact that these two vehicles of mine are two separate sizes is in keeping with G1, with Blaster being larger than Soundwave. I have no intention of getting the larger Soundwave, even with Laserbeak. I also like Soundwave to be similar in size to Megatron and Prime. I like both of the existing figures in my collection for the reasons I have mentioned. Blaster looks more like a rugged military vehicle than a Communications truck. Robot Mode: This is really where Blaster shines. Blaster stands about 7 in tall and looks VERY beefy for his function. In the G1 cartoon, Blaster was a brawler who could take it to the 'cons, and it shows! Broad shoulders, big arms,stout legs, and has NO problem standing on his own two feet! With so many strengths, could there be any weaknesses? Yes, unfortunately , there are. Articulation suffers from his body being so large. His chest section is so big, that his forearm can only reach half-way in front of him, instead of double-clutching his blaster (no pun intended). He still has some very heroic poses, but you can only get a "Han Solo" pose instead of a "Rambo" pose . Also, unlike deluxe Soundwave, who had his foot on a ball joint, there is NO foot articulation, just from the mid-ham position.His arms can bend at the shoulder and at the elbow in a 360 . Blaster has some amazing detail in this mode. First, He has blue light piping in his eyes. His chest,which is very prominent in this mode (as was G1) , is well detailed. The only thing about this guy that would have made him even sweeter than ever would be a movable visor. Not even G1 had that. Unlike Deluxe Soundwave, Blaster comes with a backplate, which can push in and out, and directly has something to do with ejecting the data discs. Purty kewel! !In short, the more I explore this guy's robot mode , the more I find, the more I like. Boombox Mode: Yes, there is an "unofficial" boombox mode for this guy. Is it awesome? Just say it doesn't really compare to the '80's boombox of G1. There are two detractors: 1.) Blaster has no foot pegs to hold the legs in place when in Boombox mode 2). This is where the backplate actually is a disadvantage. It looks so goofy! The calves make excellent speakers, but without foot pegs, the feet could "relax" so that it won't hold it's form for long. Also, I have a difficult time with getting the shoulder pieces to meet on top of the chest. But enough criticism! This looks great because it isn't THAT far off from a boombox. The gun makes an ok antenna, and it does hold it's form better than Deluxe Soundwave. It is very portable, so it does look the part. Steeljaw: Ah, yes, Steeljaw. This is an utterly disappointing toy on so many levels. First, it can't seem to hold it's "lion" form and stand on it's own. It has to crouch in order to stand him up. There's minimal articulation, and the construction is extremely flimsy. All I can give it points for is the auto-convert, and even that can be a real headache at times, if you are trying to transform him back into disk form. This is a pity, because the concept has some real potential. I would have liked this guy if his back was able to snap into place. The white "mechanical" parts are inescapably ugly. Overall , very disappointing. Keep him around, though, in order to add value to Blaster. Overall:, Blaster is not exactly the pinnacle of the Generations figures , but he is very close to it! He's big, buff and bright. His colors are awesome and he comes loaded with gimicks and tricks. Overall, I can't exactly give Blaster a "10" , but he's pretty close to it. Transformation:5 This one is extremely fun. Less work than Deluxe Soundwave and is very durable while transforming. Durability: 6 The legs and backplate are made of the same plastic as Grimlock, which makes this have somewhat of a cheap feel . The front wheels also have a cheap feel overall. Cutting corners seems to be the order of the day from Hasbro. Aesthetics:8 I would have given this guy an easy 10 if it weren't for that silly backplate. Although the thing definitely has some functionality, yet it isn't the most visually appealing feature. Otherwise Very G1. Love it! Fun: 10. This thing, although not a true Triplechanger could be called a 2+1. The boombox is a bonus, not a bona-fide mode. However, unless you are a critic, then no worries! He's great in any mode with lots of fun things to do. Together with the data disks, he's a rather cool dude. I like to group him with the "Season 3" G1's (Kup, Blur, Grimlock, Ultra Magnus, Rodimus) He just fits right in. Price: 5 The worst thing about this guy is that I bought him FULL PRICE! Word of advice-- DON'T DO THAT!! This sucker cost me $30.00! Voyagers are very expensive full price. Even my Grimlock didn't cost that much! I almost never buy any figure full price, unless I want it bad! Articulation: 6 Definitely not the most articulated for his size class. He has no foot articulation. Cannot reach across his chest. He has some neat 360 joints in basic places to give it some interesting poses, but don't think you're going to get " Gundam-like" poses with this guy. Head moves side to side with no ball joint. Overall:8-9 If you are into Voyagers with plenty of things to do, Blaster is a shoo-in! If you are looking for a super bendy guy, he's still good, but needs some articulation. Great weapon, great appearance, great fun! Even with Steeljaw, he's a must have ! The shelves won't be teeming with this figure for long, so gettim while you can!